We are happy to inform you that QuickFil 5.1 is now freeware. QuickFil is a software for designing passive electronic filters. The result is an optimized circuit of inductors (L) and capacitors (C). You can design filters up to 50th order. All limits are of practical nature. The inputs are automatically checked in order to avoid program errors which are common in this field. While you are inputing your specifications, QuickFil shows you the consequences and checks if the inputs are feasible (Timesaver). Dependent fields are updated automatically on line. You can optimize the specifications of the filter and find a trade-off between the theoretical and the practical world. Circuit topologies and values may be changed or reordered. Reverse, dual and two-port manipulations are available. You can choose the best topology concerning the mechanical limits of the filter. 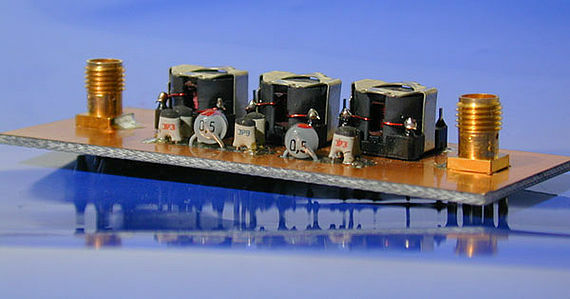 Variations in the filters are also possible using Norton/Impedance transformation and Pi-to-Tee conversions. This feature can be used to optimize your components. You will get better and cheaper components (saves money). The filter can be analyzed including losses (component quality Q). You can estimate the minimum quality of the filter components. You define different terminating resistors. This feature can be used for matching networks. If you plan to install QuickFil on Windows Vista or Windows 7 please follow our Installation Guide which can be found in the tab "Download". QuickFil is the fastest passive filter design software on the market. Only QuickFil uses special designed fast mathematical algorithms and arithmetic routines in assembler language (speed up to 5 times). Only QuickFil searches for realizable circuit, systematically. No waist of time with negative components. This feature is possible due to the high speed design algorithm. QuickFil is very easy to use. Only QuickFil checks the inputs fields and shows some important parameter in real-time, during your input. (E.g. stopband loss, 3dB edge frequency …). For every menu there is online help. You will find the most important information to the specific topic. Only QuickFil can easy design equal ripple or maximally flat pass band response and arbitrary stop band. Just define the shape of the stop band and the program will optimize the position of the transmission zeros. Only QuickFil has Bessel and modified Bessel approximations, that are very easy to design, since you can define the stop band edge frequency. Only QuickFil finds the circuits with minimum elements of an elliptical filter, systematically. You can specify parametric band pass filters, which are interesting for filters having minimum number of inductors. QuickFil helps you design filter of a higher quality. Only QuickFil can design better group delay response. You can add an allpass to the minimum phase filter. There is a special least-p optimization algorithm included. With certain approximation you can define fixed transmission zeros. This feature can be used to suppress pilot carriers. and we will send you the installation file and installation instructions. Please be aware that QuickFil was developed for DOS environments and therefore requires special handling to be run on modern Windows operating systems. The installation instructions include a detailed step by step explanation how to use QuickFil under Windows.